Growing up in Cleveland, Ohio, Iraqi-born Ahmed Rahim and his sister Reem sipped tea while their friends were swigging Coke. He grew up to become a fashion photographer, she studied fine art in Florencebut about six years ago they switched gears and founded Numi Organic Tea. 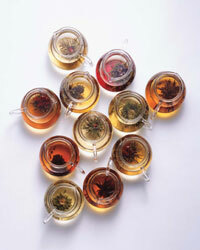 Recently, they introduced whole-leaf Flowering Teas that are as visually striking as they are delicious. Artisans in China's Yunnan province sew green, white or black tea leaves and exotic flowers into rosettes that unfurl when steeped in hot water. The nine varieties are sold in pretty bamboo bins Reem designed (about $14 for 2 oz; 888-404-6864).